"We can't keep on just borrowing from China," Obama said at a town-hall meeting in Rio Rancho, New Mexico, outside Albuquerque. "We have to pay interest on that debt, and that means we are mortgaging our children's future with more and more debt." No duh. And whose name is scribbled on the bottom of the stimulus bill? Isn't this the type of concern one expresses before spending a couple of trillion dollars? Obama reminds me exactly of the young students he lectured at ASU the other day about not getting into too much debt. He already sounds like kids calling their dad -- it wasn't my fault! I didn't know! The only difference is there is no one left out there to bail out the US - no dad, no friendly government, nobody. Hmm. this chart looks vaguely familiar. I think that with a little work I can prove that government spending causes Global Warming. Well, Ron, if you think this chart is impressive, you should see the postal rates chart Russ posted on Cafe Hayek. It has to be the postal rates - the graph is very impressive. I bet a chart of Al Gore's weight change and global warming would give us yet another impressive conclusion. I think it's time to forcibly starve the Goracle to save mother earth. Who's with me?! Meanwhile, we're turning into Zimbabwe. Obama sounds a lot like Big Brother..."We're at war with EastAsia, we must continue to team with EastAsia in our war w/ Eurasia." The script changes 180 deg to suit the current need, but he just continues on w/o skipping a beat. I'm still looking for an apt metaphor to describe Obama's remarks. Read what he said carefully ... Obama is softening us up for the next round of The Plan. Obama now admits that his deficits are "unsustainable" and that they will result in intolerable higher interest rates unless reined in ... and so Obama says we face "tough choices." Obama assumes we'll be out of the current recession by 2010, that Iraq will have been wound down, and his party has a lock on Congress -- so what's his excuse for a planned-for $600 billion to $1 trillion or more annual structural deficit from 2011 until infinity. He can blame Bush & Co for 2009, but not beyond that. No President has deliberately put us on such a fiscal course. Ironically -- until WWII -- even FDR had to balance his budget each year, more or less. I'm not an anti-deficit nut ... we can probably carry average deficits of $200 billion per year -- but like any household you shouldn't plan to live beyond your means. If our growth slows, Obama's budget blows up even faster. I couldn't dream up a set of initiatives that would be more anti-growth than Obama's. Even his government spending is anti-growth ... find me any "investment" being made that has a positive net present value. Without growth, it all comes crashing down. After 2010, we won't hit 2% ... and this is without factoring in the risk of "things that could go wrong." 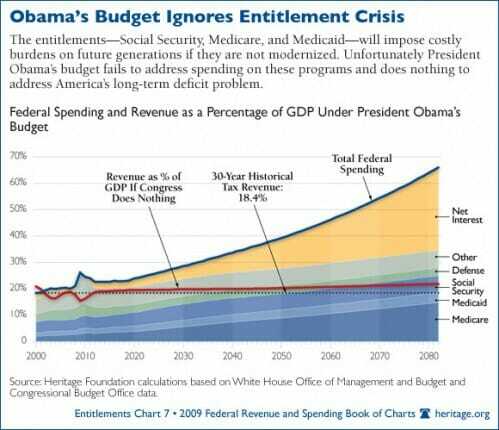 So if Obama now says these deficits are "unsustainable" what will be his answer ... cut spending ... or raise taxes. On the CBO's numbers we'd need to double the federal income tax on the top half of Americans to close the gap ... read that last sentence again slowly. I've suspected for some time that creating enormous deficits -- and then raising payroll taxes -- is part of the Obama-Axelrod master plan to level society. Know I know for sure. Obama is not berating himself and Congress for the debt; he's paving the way for massive (extremely massive) tax increases that will cover current (absurdly high) expenditures and pay down some of the debt. What to expect: big hikes in tax rates for high earners, no cap on FICA withholdings, and annual "wealth" taxes that grab parts of the estates of the "rich." The government already has pre-emptive taxation: anyone who earns over $200,000 and moves overseas is assumed by the government to be a tax avoider. The IRS slaps a massive tax on existing wealth and taxes your foreign income for years (even if you've become a citizen of your new country). tax hikes of the magnitude required to cover these programs are simply not going to happen. the political will and the will of the demos is simply not there. it leaves one option: massive inflation. i know it's all the rage to speak of deflation at the moment, but with china, japan, and saudi backing off our debt, the only buyer is going to be the fed. that is functionally identical to just running the printing presses. the teens (2010-29) are going to be a decade of 70's style inflation. if you can't pay the debt, make the currency in which it is denominated worth less, and it accomplishes the same thing. this will have nasty social consequences, but it will predominantly hurt rich savers (and benefit those in debt) so i see it as politically attractive to populist politicians. The IRS slaps a massive tax on existing wealth and taxes your foreign income for years (even if youâ€™ve become a citizen of your new country). I agree with your post, but I must correct you on this. The tax on wealth kicks in only if you are RENOUNCING your citizenship - not if you're merely living abroad. At the time of renunciation, if the value of your worldwide assets exceeds $2MM, then your assets and liabilities are assessed and netted at the current market value and a long-term capital gains tax is assessed on any "profit" above $600K. Upon paying the capital gains tax, you are released from citizenship and relieved of income tax obligations going forward. The U.S. no longer taxes your income once you immigrate out of the United States. Now, they just rob you on your way out. The HEART legislation passes last July added the wealth tax and eliminated the tax on income for ten years after renunciation of citizenship. I guess it was too expensive to collect. So, if anyone has relatively few assets, but high earning potential, now may be the time to escape. I don't disagree with the comments posted here. I only disagree that the will to tax is not there. It has been there in the past and it seems to be picking up steam recently. Why do you think the will is not there? With regard to inflation, I'm torn. I'm not sure it's entirely clear that we won't turn out like Japan. Although, if our creditors back off, I'm not entirely sure that we will escape a full blown currency crisis which will be "fixed" by wealth confiscation as the political will to increase the skyrocketing inflation brought on by a dollar collapse to pay down debt won't be there. In such a case, I think it'll be more politically palatable to "ask" the "rich" to "do their part" by handing over their wealth because "we are all in it together". I expect 401Ks and IRAs to be confiscated first. For this reason, I've not contributed to my retirement fund for a year. Methinks is probably right about 401k, etc., and theyâ€™ve been laying the groundwork for this for some time. The flagrantly lawless and reckless shafting of Chrysler (and probably GM) secured creditors puts a giant flashing "fascist" sign on the White House lawn, in addition to sending shockwaves thru the credit market. These people are beyond radical, and have begun the process of undermining private property and contract law, the very foundations of our society (to this point). There is absolutely nothing they will not do, and imposing punitive, exorbitant, and unmanageable taxes is not only well within their repertoire, it's part of their gameplan. A fascinating chart. It begins ten years ago and projects expenditures over an 80-year period. And just what would one have learned from a chart drawn in 1929 that projected government expenditures through 2009? Makes Global Warming Hockey Sticks look good! Iâ€™ve suspected for some time that creating enormous deficits â€” and then raising payroll taxes â€” is part of the Obama-Axelrod master plan to level society. Know I know for sure. That has already begun. Obama's recent tax proposal applies self-employment tax on carried interests. Capital gain, interest, royalty and rental income that has historically been exempt from SECA would be subject to it, presumably without a cap. They don't actually have to confiscate IRAs and 401k plans. They just have to threaten to do something bad with them (wealth tax, forcible annuity purchase, confiscate and replace with government benefit, strip Roth benefit). The uncertainty will prompt many to premptively cash out and pay the tax plus penalties. That would be a big tax windfall for Uncle Sam. Obama will say that looming Medicare/Social Security deficits have to be addressed -- that he inherited the problem, but that he wants to make the tough choices to provide a solution. Hold onto your wallet. The fiction that these programs are separate self-funded insurance programs is no longer convenient as we've passed the demographic tipping point ... so that these programs have started to be a drain on the big revenue pool -- until recently they've been putting in more than they've been taking out. Also, we're already giving rebates on payroll taxes to those who pay no income tax -- breaking the idea that Medicare/Social Security are anything like a real insurance program. Obama can win the votes of worried older Americans by expanding the tax base and rates on the rest of us to cover looming shortfalls -- he need only start with the top 5%, by going after everything they own or take in to set the precedent. The math will require this be expanded to a lot more of us than the top 5%, but that can come later. To me its never been about 95%/5%, or 35%/39.4% .... it's about 3.5%. If we hit anything like our long-term growth rate our GDP doubles in about 22 years, and each generation is twice as well of in about 33 years. I'd be pressed to come up with more ways to kill growth than what Obama's come up with. If we keep going down this path, it'll be very hard for folks to save responsibly for their own retirement. Let's see ... high tax rates on current income ... a low-growth economy ... inflation ... confiscatory tax rates on exit ... threat of outright appropriation ... why bother? I actually believe that Obama-Axelrod have thought this through as a plan for creating a permanent majority. They want to tank the economy to solidify political power.